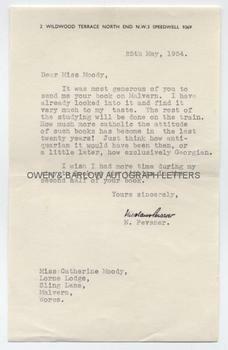 SIR NIKOLAUS PEVSNER Typed Letter Signed. British (German born) architectural historian. TLS. 1p. 2 Wildwood Terrace, North End, NW3. 25th May 1954. To Miss [Catherine] Moody. "It was most generous of you to send me your book on Malvern. I have already looked into it and find it very much to my taste. The rest of the studying will be done on the train. How much more catholic the attitude of such books has become in the last twenty years! Just think how antiquarian it would have been then, or a little later, how exclusively Georgian. I wish I had more time during my stay to look at the titbits in the second half of your book." With a good autograph full signature. 8vo. Approx 8 x 5 inches. Fine. Sir Nikolaus Pevsner was born in Leipzig and was assistant keeper at the Dresden Gallery before becoming a professor of English art and architecture at the University of Gottingen. Although he is said to have welcomed many of the cultural and economic policies of the early Nazi regime, he was unable to work in 1930s Germany due to the ban on Jewish workers and left for England in 1933. He will always be associated with "The Buildings of England", a series of books that he wrote and subsequently edited and which became the "bible" for the study of English architecture. These books are still a primary and indispensable source of reference and are known simply as "Pevsner". Nikolaus Pevsner delivered lectures at the St James's School and Malvern Library in 1954, where he met local artist, Catherine Moody. Her book "The Silhouette of Malvern" was to form the basis of his research on the area when in 1955 he began work on the County of Worcester for "The Buildings of England". The letter is from the studio archive of Catherine Moody and her father, the artist Victor Hume Moody.